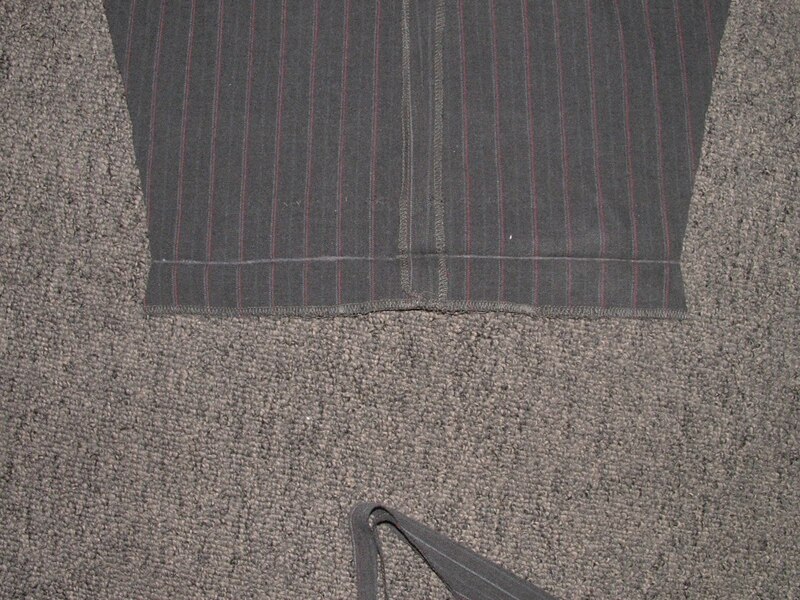 I picked up some grey pinstriped pants at a garage sale a month or so ago that I thought I could wear for substitute teaching. Turns out they were a bit too small and the cut was a little funny anyway. 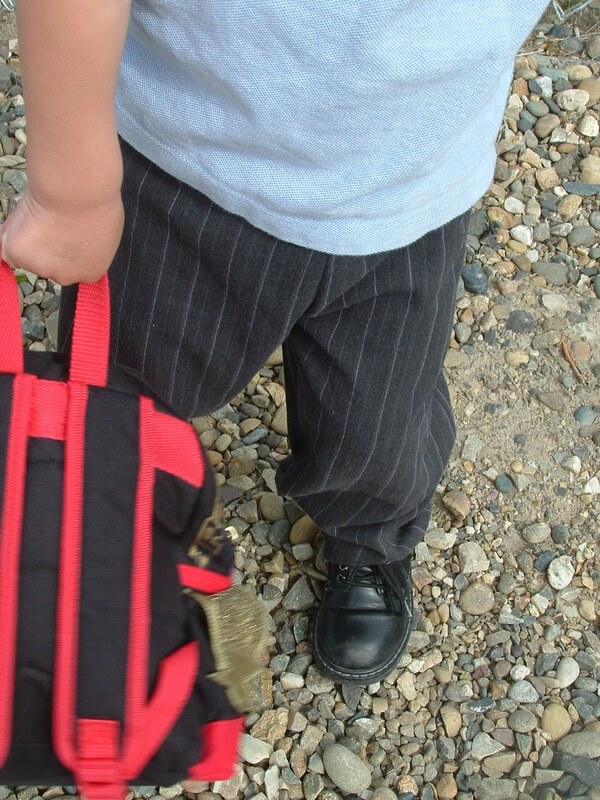 Boy is just about to grow out of his current sets of Sunday clothes, so it was time to get some new ones ready. I had hoped I'd be able to make a matching vest as well, but there wasn't quite enough fabric. If I'd been using some of Hubby's pants, I probably could have managed it. I didn't time myself, but I started them late into the evening, and they were done before I went to bed...so they went really fast. 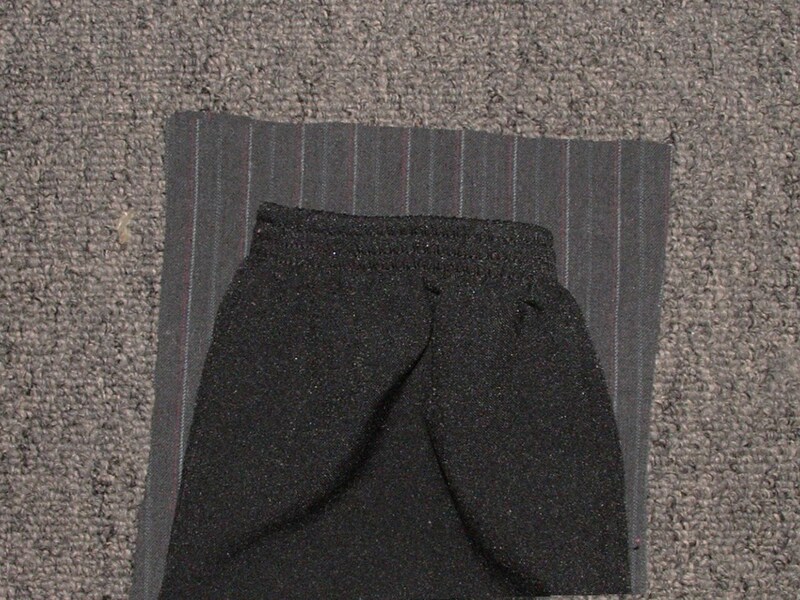 I took a pair of 3T pants the size I wanted to make, and folded them in half to make my pattern. I lined the hems up even with each other, so I wouldn't have to make a new hem. 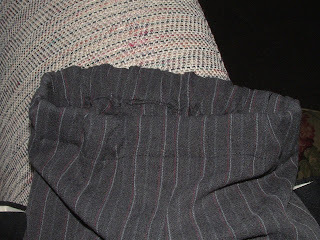 (I am LOVING refashioning clothes because it can save so much work on reusing hems and other things. 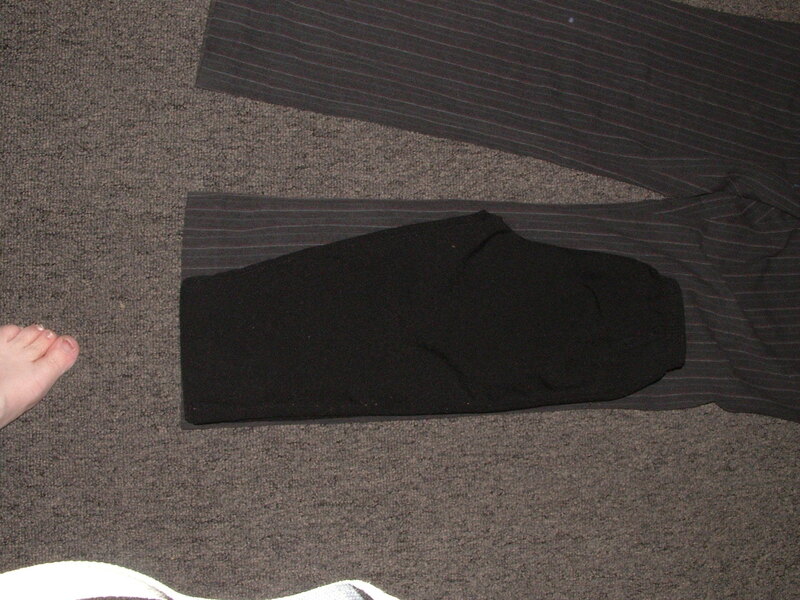 I also lined up side with the side seam on the pants, so didn't have to resew that. 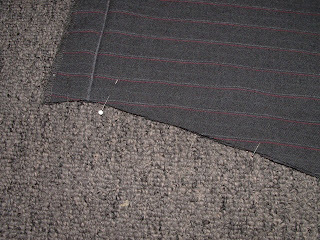 On the sides where I had to cut, I eyeballed adding about 5/8 of an inch for seam allowance. Even though, I reused the hem, I had to unstitch the existing hem, so I could sew the new leg seam. Then I pinned right sides together to sew the inside leg seam. Then I turned one leg right side out and slipped it inside the other leg, pinned, and sewed the crotch seam. When I sewed this seam, I double stitched the crotch part to make sure the stitching was extra secure and then trimmed and notched the curve. 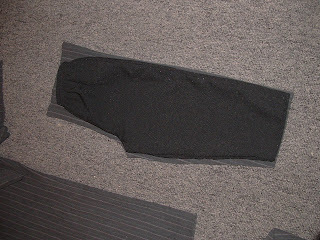 It's also a little hard to see in the picture, but on one side sewing this seam, I used a regular 5/8 inch seam allowance. On the other side, I used quite a bit wider seam allowance...more like 1 1/4 inch. The reason is that if you're working with a "real" pattern pant legs are almost symmetrical, but are a little smaller in the front than in the back to make room for your bum. When you use sewn pants folded in half as a pattern, you end up with just a bit more fabric in the front than you need and it can look a bit poofy. 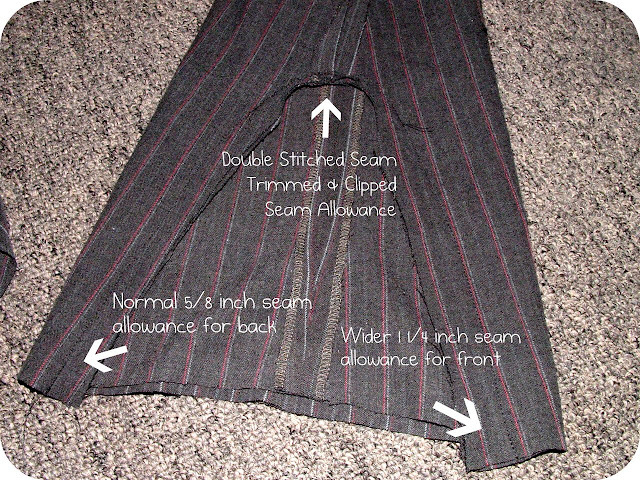 My just sewing a wider seam allowance in the front, you get rid of that extra fabric without having to figure out how to cut your pattern smaller. At this point, I was getting excited enough to finish, that I forgot to take picturse of the waistband. It's super easy though. 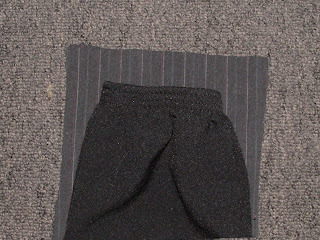 You just fold under the top edge about 1/4 inch and then fold it under again about 1 to 1 1/4 inches. 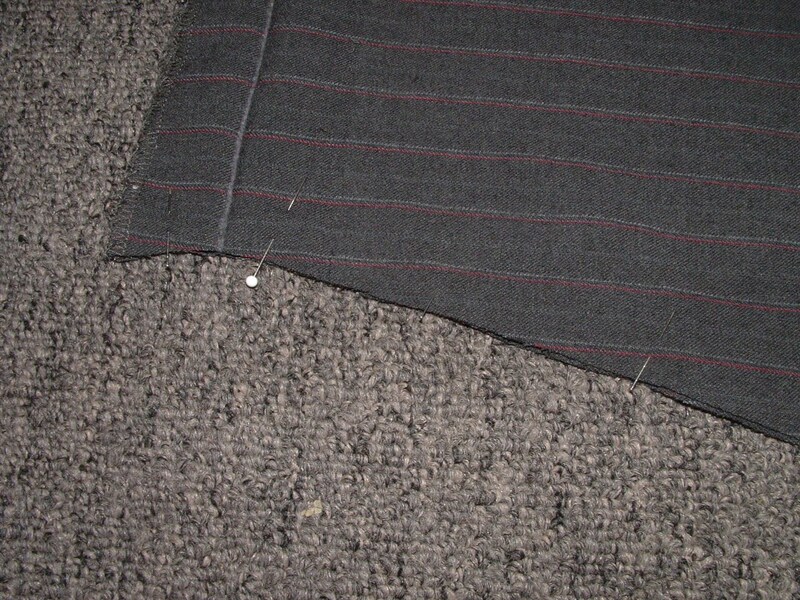 Iron and pin it to make sure it's even and then stitch, leaving an opening to run the elastic through. After I'd put the elastic in, moved the fabric around, so that there was more fabric in the back than in the front. This gives the front a flatter appearance and makes them look more like Dad's church pants. 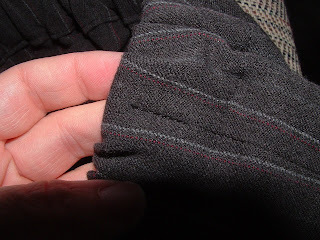 Then I did a little straight stitch at the side seams through the elastic to keep the fabric in place and also to make sure the elastic doesn't twist or fold in half inside the waistband. 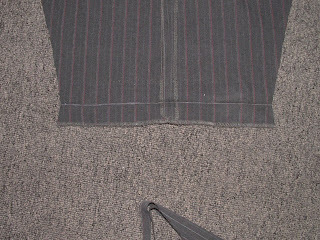 (Sorry, it's hard to see the seam...but that's a good thing since you don't really want to see it anyway. And they're all ready to wear to church! ...and even if he won't put down his backpack to take a picture. 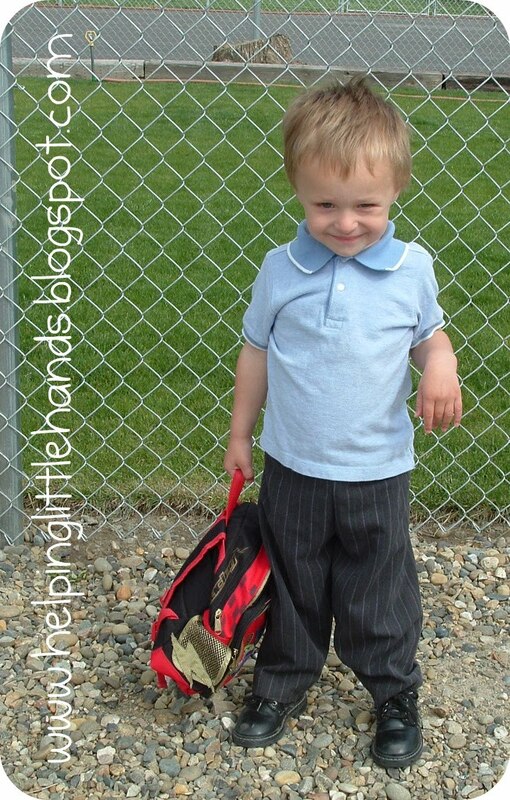 He's still a handsome little man. What a great idea! I did something like this years ago for David, but I went out and bought a pattern and took all the seams out of the big pants - never dawned on me to reuse the side seam and hem. So smart! When I make things like this, I like to stitch a bit of seam binding into the waistband at the back to make a "tag" so it's easy to tell back from front when getting dressed. What a great idea! I'm a new follower...thanks for sharing! gotta love recycling...especially when they grow so fast. Those are adorable, and so is he! Wow, what a fantastic idea! I'm so impressed that you could turn adult pants into toddler pants. Thanks for the inspiration! 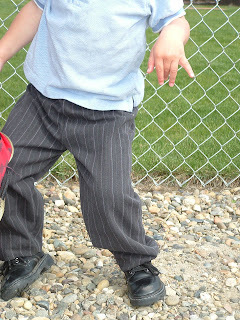 Super cute - I love a little boy in man-fabric pants. It's such a great look. I'm a new follower! I love this! I have such a hard time finding nice pants (that don't look like pajamas!) for my baby to wear to church. I will definitely be keeping my eye out for suit pants and other nice materials now. Thanks! 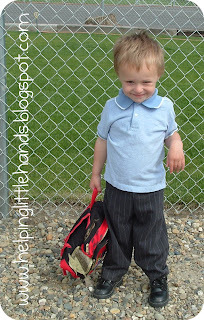 Thanks for linking up to Tot Tuesdays. I wish I could sew. You make it look so easy! Have a great week!